During the recent meeting in Caracas of the Venezuelan Presidential Economic Advisory Commission, in mid-June 2018, President Maduro said something extremely interesting, but also extremely disturbing – nonetheless highly important for the region to be aware of. Mr. Maduro mentioned Yugoslavia, the foreign induced local conflicts, the breakup and dismemberment of Yugoslavia, starting with the “Ten Days War” on Slovenia in 1991, the Croatian War (1991-95); the Bosnia War (1992-95); the Kosovo War (1998-99), culminating with the Clinton induced 69-day NATO bombing of Kosovo, under then European NATO leader Wesley Clark (today the Repentant – in retrospect it’s easy to be sorry), pretending to save the Kosovo Albanians from Serbian Milosevic’s atrocities. How Milosevic served as a patsy for the imperial forces is another story. All of this would not have been possible without a decade long preparation by several Fifth Columns infiltrated and trained in and outside of Yugoslavia, the only country in Europe that in the 1980s and 90s flourished, with general wellbeing above that of the average Europeans, who were suffering recessions and increasing inequality, the beginning of xenophobia in the age of nascent neoliberalism. There was no extreme poverty in Yugoslavia, but prosperity without excesses for everybody. There was economic growth under a loose Mao-model socialism which could, of course, not be allowed to persist, lest it might serve the world as an example. Besides – the breakup of Yugoslavia into chaos was needed to create mini-states that are in conflict with each other, some of them still today, and that could be ‘accommodated’ against a hefty ‘fee’, of course, to accept the installation of NATO bases – ever an inch closer to Moscow’s door step. Well, Mr. Maduro saw and sees it clearly. History repeats itself all too often, especially when it comes in the form of western neoliberal-neofascist atrocities, as people’s memories are dulled with lie-propaganda. In fact, there is hardly any real news, only ‘fake news’ in the western mainstream media. Mr. Maduro envisions that “their” plan for Latin America is similar to what “they” did to Yugoslavia. He is probably right. All signs point into this direction. 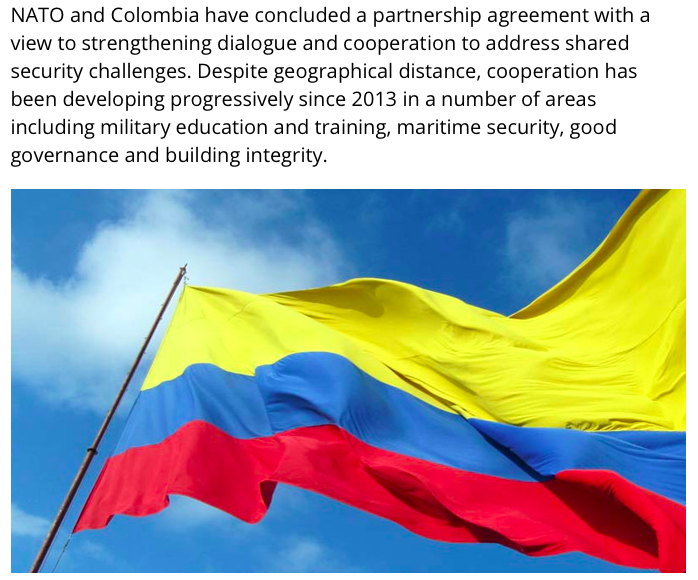 A pact between Colombia and NATO, a so-called “Security Cooperation Agreement” was first signed in June 2013 – but prepared way before. Records of first communications to this effect, by Juan Manual Santos, then President of Columbia – and Peace Laureate in 2016 for his traitorous Peace Agreement between the Colombian Government and FARC (vaya-vaya! Doesn’t this speak volumes by itself? ), can be traced back to the early 2012. President Hugo Chavez was the first one to warn his Latin American partners of the imminent clandestine infiltration of NATO into South America. Nobody listened. Today it’s a fact – too late to fight against. NATO troops are occupying gradually all seven American military bases in Colombia. They are just simply converting from US to NATO bases – sounds more palatable than US bases – for sure. In the minds of unfortunately still most uninformed or mal-informed people, NATO stands for security. NATO – the North Atlantic Treaty Organization – in South America, what an oxymoron! – Well, it is the same ‘security’ farce as is NATO in Afghanistan and bombing the Middle East. Venezuela is full with Fifth Columnists. They are the ones that facilitate the highly speculative and inflationary manipulation from Miami of the black-market US dollar rate in the streets of Caracas; they are the ones that emulate the food shortages in Chile 1973, successfully disappearing duly paid-for imported merchandise, mostly food and medical supplies, ending up as smuggle-ware in Colombia, leaving empty supermarket shelves in Venezuela. All meant to instigate people to stand up against their government. So far, this strategy has failed bitterly. On 20 May 2018, President Maduro has been overwhelmingly re-elected, under the most internationally observed elections the world has ever experienced – and the result was “the cleanest, most democratic elections we have witnessed in our history of worldwide 92 election observations” – so the US-based Carter Institute. Yet, the Fifth Columnists are relentless. Worldwide. They are immersed in the government apparatus, institutions, military, police – even Parliament – and very important in the financial system, possible in the central bank. They “allow”, or rather promote, the manipulation of the US-dollar black market, causing sky-rocketing inflation and lack of food and medicine on supermarket shelves. They disrupt electricity, internet and water services. The approach is similar in every country that refuses to bend to the empire’s dictate. In Russia, Iran, China, Syria, South Sudan, possibly even in Cuba – they are in control of the financial system – that’s also how they are easily being financed, through the dollar-based monetary fraud of the west, to which most countries still have some links – fortunately every day less. 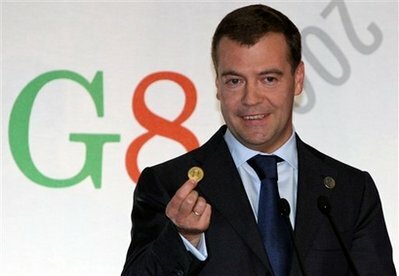 Take Russia, the Central Bank is still largely run by the Fifth Columnists, whose ‘chief’ is Putin’s just recently re-appointed Prime-Minister, Dmitry Medvedev, an arch-Atlantist. The structure of the Russian Central Bank is even today mainly a remnant of the Russian Reserve Bank, designed by the FED after the collapse of the Soviet Union, with the help of the UN-masked Bretton Woods crooks, the IMF, World Bank. Similarly, part of the masked international promoters of instability, are the Bretton Woods regional associates, the so-called regional development banks, the Inter-American Development Bank (IDB), the Asian Development Bank (ADB), African Development Bank (AfDB) and their sub-regional cohorts. In the nineties, the Gang was joined by WTO – the World Trade Organization. And here they are, the world’s three most hated international UN-backed financial and trade organizations, IMF, World Bank and WTO. All three are promoting fundamentalist “free-marketeering” across the globe, especially throughout the southern hemisphere (though Greece and southern Europe do not escape), indebting and enslaving countries to the western corporate oligarchs. All well-structured to control the world’s financial system – so as to march towards world hegemony of a One World Global Economy. We are almost there, though not quite yet. There is always hope. Man’s last shred to hang on to life is HOPE. And only Man can translate hope into reality. So, as long as we have life, it’s not too late. Why is it so difficult, say – impossible to get rid of them, the Fifth Columnists, the vermin of any unaligned political system? – Why did President Putin re-assign Medvedev as his PM? – Mr. Putin knows that he supports a network of Atlantist oligarchs that seek nothing more than to ‘putsch’ him, Mr. Putin – and ultimately to destroy the rather egalitarian, though capitalist-based, economic system Russia has enjoyed for the last almost 20 years – becoming self-sufficient in agriculture, food, industry, high-tech science, pharmaceuticals. – Russia has developed herself into an exemplary “Resistance Economy”, ready to be emulated by any western-named ‘rogue’ state that is sick and tired of the Empires boots and bombs and forced ‘democracies’ through ‘regime change’. There are many western countries that just wait for a leader – one that moves head-on. Russia, China, Venezuela, Iran, Cuba, are shining examples. They are gradually escaping the yoke of the dollar-dominated western economy. So, why are countries like Russia, Iran and maybe Venezuela afraid to get rid of their Fifth Columnists? For fear of a civil war, of a blood bath? Yes, we have seen the violent unrest they caused in preparation of the two major democratic elections in Venezuela in the last 12 months, the National Constituent Assembly (30July 2017) and the Presidential Elections on 20 May 2018, when altogether close to 200 people died. The media immediately blamed the death on police and military oppression and violence – but the only armed protesters were those armed and funded by Washington, and responsible for more than 80% of the death. Chavistas cheered for their Government with their bare fists. The question remains in the room – why does Mr. Putin not get rid of them, the Fifth Columnists? – Would they cause a civil, war? – It seems to me they wouldn’t have sufficient supporters in Russia, but they could disrupt the internal economy, as the Russian internal financial systems – especially private banking – is still in the hands of these Atlantists. They are also in China, but it appears that President Xi Jinping has better control of them. How about Iran? Why are they still able to hold on to and fight for ‘western deals’, i.e. the upholding of the Nuclear Deal that Trump has stepped out from and now is sanctioning Iran ‘with the most severe sanctions the world has ever seen’ – sounding similar to what he said to Mr. Kim Jong-un, the ‘Little Rocket Man’, with whom Trump then made peace a few weeks later? – Or something like it. One never knows with the Donald, what’s the meaning of Trump’s trumpeting, other than screwing up alliances and creating physical and sociopsychological chaos. He is also threatening European corporations, mostly oil companies, with heavy sanctions if they dare maintaining their contracts with Iran. Many cave in. Among them, the French-UK owned Total, Italy’s Eni and Saras, Spain’s Repsol and Greece’s Hellenic Petroleum. In the case of Total, according to the director of the Venezuelan branch, instead of filling their contracts with US-“fracking” oil, as Trump would expect, they are negotiating with Russia, to fulfill their obligations in Europe and elsewhere. “We cannot trust Brussels to fend for us, therefore we have to fend for ourselves”, the Total representative said. Iran doesn’t really need the Europeans to buy their oil. Europe constitutes only about 20% of the Iranian hydrocarbon market – an amount easily taken up by China. The same with other European corporations that may choose similar ways of self-protection – cutting ties with Iran – like the Peugeot-Citroen automobile giant – Iran doesn’t need them. That these sanctions and EU corporate reactions to the US sanctions, are causing hardship and unemployment in Iran – is just western propaganda, a vast exaggeration, at worst a temporary affair. As Mr. Rouhani said – we might go through a short period of difficulties but will recover rapidly by becoming self-sufficient. And that’s true. Iran is well embarked on their “Economy of Resistance”, aiming at self-sufficiency through import-substitution and orienting themselves towards eastern markets. 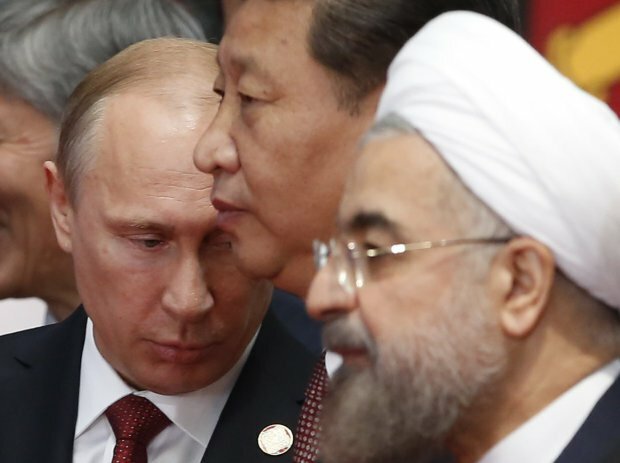 In fact, Iran is already part of the Eurasian Economic Community and will soon become a full-fledged member of the Shanghai Cooperation Organization (SCO). – So – why can Iran not get rid of their Fifth Columnists? – This is a question I can only answer with “fear from bloody civil unrest, prompting possibly western military intervention”. 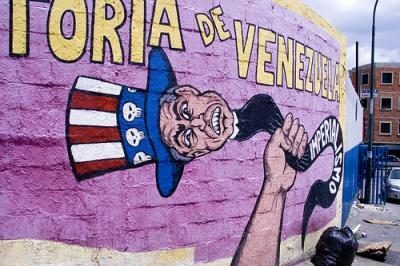 Back to Venezuela – it could be similar fears that prevent the Maduro Government from taking drastic actions, like declaring a temporary state of emergency and drastic measures of de-dollarization to stop inflation and speculation, and strengthen the local currency, the Bolivar, by backing it with their internationally accepted cryptocurrency, the Petro. On 20 May 2018, six million Venezuelan’s mostly Chavistas, voted overwhelmingly for President Maduro and his Government, a 68% majority, representing a solid block of people supporters. If you have the choice between an artificially made-to-starve population and a crumbling what used to be a solid block of 6 million Chavistas behind you – but gradually disappearing because of lacking actions by the government – what do you do? – Perhaps the only way is to economically isolate the Fifth Columnists or Atlantists, despite their apparent control of the economic system. What Atlantists are actually controlling is the dollar-based economy. Quitting the dollar-base, they may become rather powerless. Venezuela faces a dire dilemma: Die or be killed. Venezuela has already started moving out of the dilemma, with the creation of the totally dollar-detached Petro, the government controlled blockchain currency based on hydrocarbons and precious minerals. Today, Venezuela imports about 70% of their food, and guess from where? – You guessed right – from the US of A. Thus, de-dollarization at first sight is a challenge. Therefore, a massive diversification of imports, and efforts to become food self-sufficient, is in the order. Venezuela has the agricultural potential to become 100% food self-sufficient. In the meantime, Russia, China and other Eurasian countries will substitute. Venezuela may apply for SCO membership. Why not? After all, China has already about 50 billion dollars’ worth of investments in Venezuela, mostly in hydrocarbons, and just declared making another 5-billion-dollar equivalent loan to refurbish the Venezuelan petrol industry. China and Russia have big stakes in Venezuela, an excellent defense strategy. Now, Venezuela’s membership in the SCO would be another big step away from the dollar economy. The Balkanization of Latin America is already happening. When Mr. Maduro referred to the 7 US bases in neighboring Colombia, aka, now NATO bases, with a porous 1,500 km (out of a total of 2,000 km) uncontrollable jungle border with Venezuela, and even open and welcoming borders with Peru, Ecuador and Brazil, he said it all. It will be easy to suffocate any uprising – NATO will do it, by now the generally accepted world police, as generally accepted as the recently intact, totally unelected and self-appointed world government, the G7. They are now crumbling, thanks heaven for Mr. Trump’s egocentric pathology, his “Let’s make America Great Again”; and thanks to Mr. Putin’s non-intervening but strategic sideline observance. Will Trump continue to provide majority support for NATO? He recently warned the Europeans to contribute their share, i.e. increasing their NATO contribution to 2% of their GDP – or else. Well, what is “else”? – Reducing NATO, an enormous cost to the US? – And counting on the CIA-trained and NED-funded destabilizing insurgents (NED = National Endowment for Democracy, a state department financed “regime change’ and “democratization” NGO) throughout the world? – Insurgents in alliance with the local Atlantists? Will this be enough in a rapidly changing international monetary and payment system. The US scheme for Balkanizing Latin America, and by extension the world, is as porous as the 1,500 km long tropical forest border between Colombia and Venezuela. The hegemony of the dollar-economy hangs in the balance. Only drastic actions by victimized but courageous countries, like Venezuela, Iran and Russia can break the balance and destroy the western monetary hegemony.